Ronan Curtis believes Stephen Kenny has the qualities to take the Ireland job. RONAN Curtis believes Dundalk boss, Stephen Kenny has earned his shot at managing the Republic of Ireland. Ex-Derry City manager, Kenny is being mentioned as a prominent candidate for the vacant post and has described managing Ireland as the ‘greatest honour you can have as an Irishman’. 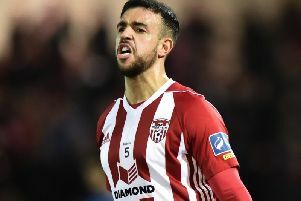 And former Derry City striker, Curtis, who won his first competitive cap for Ireland in the 0-0 draw against Denmark in Aarhus on Monday, has backed calls for Kenny’s appointment, claiming he has all the credentials to step into the breach. “I know all about Stephen Kenny,” said Curtis, “He’s a great manager and has done a lot for Dundalk. He’s won the league and cup double a couple of times so he’s a great manager who has done well in his job. Curtis, whose appearance as a substitute against the Danes earned Derry a tasty five-figure sum as part of the deal which took him to Portsmouth in the summer, admits he was ‘gutted’ to learn of O’Neill’s sudden departure on Wednesday. Ronan Curtis pictured in action against Northern Ireland on his Ireland debut last week. And the Donegal native says he’ll be forever grateful to O’Neill for giving him his chance in the senior set-up and hopes the Co. Derry man’s successor will keep faith in him. “I didn’t see that coming at all,” said Curtis. “It came as a big surprise. He’s a good manager and the backroom staff were lovely. They gave me my debut so I didn’t see anything wrong. O’Neill had capped 12 new players in the last nine games ‘with the aim they become significant international contributors in the coming campaign’. And Curtis is hoping whoever comes in to replace O’Neill continues to give youth a chance.